RICHMOND, VA (August 4, 2015) – While the first-ever female NFL and NBA coaches have been making headlines, PDA Arsenal Head Coach Meg Ryan should be added to the list with another first in women’s coaching. Ryan is the first female head coach to win an ECNL National Championship. 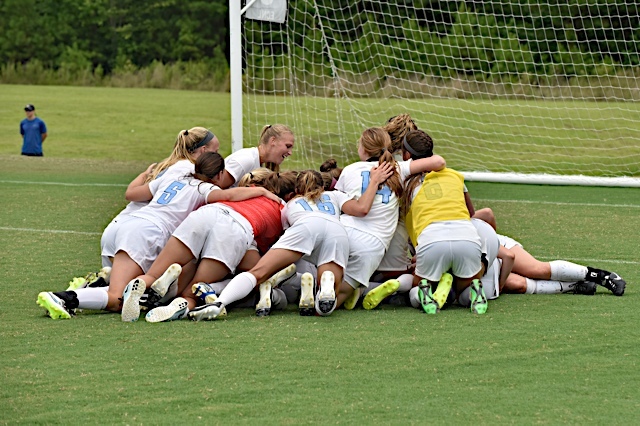 Photo By: Logan Whitton / Harrelson Photography INC.
With a championship win against Crossfire Premier in penalty kicks on July 18 at West Creek Fields, Ryan led the PDA ECNL U17 team to the ECNL National Championship after emerging from a tough bracket. “To be labeled as the first female coach, I’m extremely honored and lucky, but I have to obviously thank the team because without them this would not have been accomplished,” said Ryan. She has been the head coach of the team since they were U14, with nearly the same roster for the past three years. Whenever Ryan talks about the team, one word resonates: family. Throughout the season it was this close bond that helped them overcome the little battles on the way to victory. Before the team left for the ECNL Playoffs in Seattle, Ryan had each player write in their own words what it meant to be on this team, and had each player share their thoughts aloud. Many players remembered their U14 season when they were the only PDA team to not make it to the ECNL playoffs. The sting of not making it three years ago pushed the team towards the ultimate victory this year in several of the players’ final season. Crossfire Premier scored late in the second half to tie the game, pushing the trophy further from Arsenal’s reach. Ryan was concerned about the team’s mentality in the final minutes. But she recalls the moment the team switched the momentum in its favor, when she gathered the players, and said, “Remember what you wrote.” The moment when a team begins to struggle mentally is when coaching matters the most. Ryan’s focus helped push the team, motivating the players to push a little further. Ryan was an assistant coach with the PDA Slammers under Mike O’Neill who won back-to-back ECNL Championships. She knows what it feels like to be at the top, but this year wanted to be there with the team she’s bonded with over the past three years. All of the hard work and sacrifice with this particular group, her family, made this championship unlike the others and hard to describe. Ryan is in her second year as an Associate Head Coach for Rutgers University where she played from 2003-2007. She works beside Head Coach Mike O’Neill, where family remains a theme. Meg, you are an Amazing Young Woman. Congratulations on your achievement and good luck as you continue your coaching career.